This week's movie review is on The Theory of Everything. Let's do a short summary on the movie shall we ? 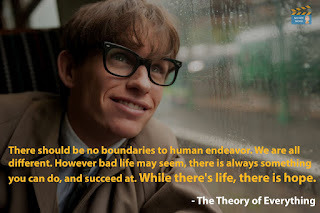 It's a movie about a young man who goes to Cambridge University in pursue of his doctorate in Physics. In his group of friends , he is the most brilliant one as this can be seen where he answered 9 out of 10 extremely challenging questions while his friends are all just blabbering nonsense on the paper. " I could only do nine" that was the quote he said to his professor. One on day , an idea came flooding into his mind that time had a beginning. He was so excited and during he walked proudly , he stumbled and fell on the hard concrete floor. This incident caused him to have a disease called motor neuron disease which gradually consume his muscle abilities until he was completely paralyzed. However , this disease did not stop his girl of his dreams , Jane Wilde to love him just the way he is and finally married having kids. During their many years of marriage , Jane's patience was tested again and again because she had to kill two birds with one stone by focusing on her phD for poetry and trying to take care of her ill husband and kids. Finally , Jane was advised to join the choir group at church, That's where she met Jonathan who helped her during her family crisis. Unfortunately , this had floated an affair between Jonathan and Jane. In the meantime , Stephen was enjoying his time with his new maid , Elaine until he asked her to join him to travel to America to receive an award. 1. Viva - used to express goodwill : He then introduced the practice of following the lecture with a viva voce examination on what had been delivered.